Poised between the sweetly feminine fifties and the revolutionary "mod" look of the sixties, 1959 brought fashion to the brink of change. Kitty Dale, 1959: A Collectible Vintage Fashion Paper Doll features Kitty with her crinolined skirts, bolero jackets, stiletto heels, a mink jacket, "wiggle" evening gown with a fishtail flounce, pretty prom-perfect lace ballerina length dress, peddle pushers and much, much more. Full color paper doll book for vintage clothing collectors, costumers, nostalgia enthusiasts, and paper doll lovers of all ages. Beautifully rendered, carefully researched in Kim Brecklein's usual meticulous style. 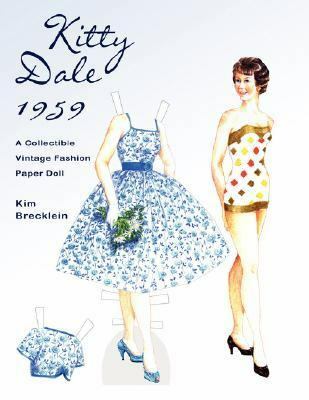 One doll, 12 outfits, total 18 items.Brecklein, Kim is the author of 'Kitty Dale 1959: A Collectible Vintage Fashion Paper Doll', published 2007 under ISBN 9781430321514 and ISBN 1430321512. Loading marketplace prices 151 copies from $12.23 How does the rental process work?